Surgery went well, but I am in a crazy amount of pain. They say I will be walking tonight! It is 11pm, we will see... sheesh. 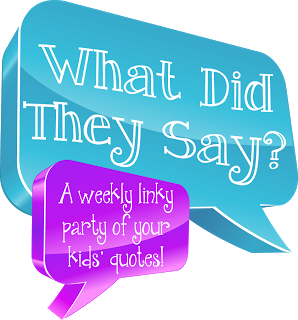 I am joining up on the What did they say linky party! I am in my room recovering from surgery, and I was thinking about what my kids have all said, and one needs a picture attached, so I will do that one next week, but this one was HILARIOUS! Mind you, I teach first grade so to hear this in first grade, AND from a girl, I almost peed my pants. So I have a bathroom in my classroom. I have the kids trained that they take a wipe, and they wipe the seat, lift the seat, and wipe that (boys and girls!) and then wipe the floor. No matter if they sprinkle or not. My bathroom is always gleaming clean. Everyone comes to use my bathroom because they know it is clean! So anyway, I had little boy go in and apparently had to go numero dos. He was in there quite some time, and a little peanut of a girl went in right after. "Hey Where is your courtesy flush man?!" My mouth dropped over and I almost spit out my drink I laughed so stinking hard!! I'm happy to hear the surgery went well! I saw it on PT earlier too! Thanks for the funny story....I miss first grade sometimes! Take care and happy healing! Too funny!!! Hope your are feeling better soon! Oh my gosh that's hysterical! Also... a genius idea. My kids always leave the bathroom a mess... no matter what I tell them. I think I'll be instituting your wipe routine tomorrow! Thanks for linking up and I'm glad your surgery went well!